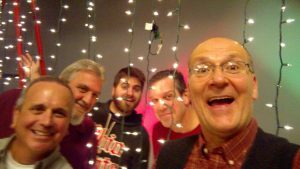 The Facebook LIVE Crew: (L to R) Ray Monell, Lee Swisher, Eric Monell, John Hughes, and me! 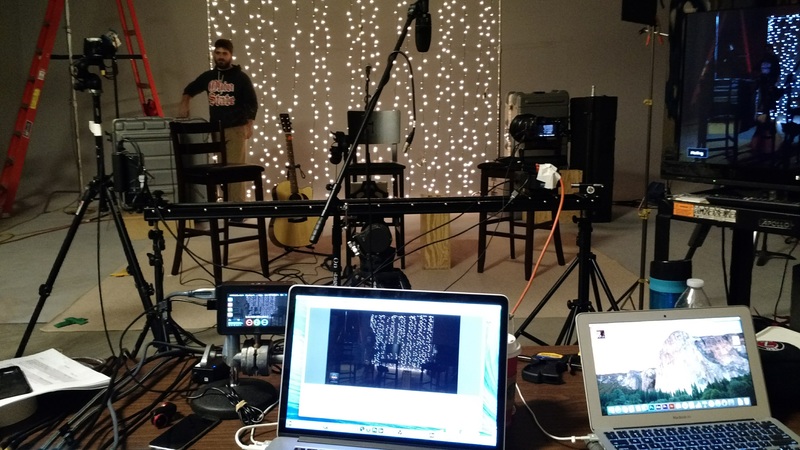 This was my first experience doing a FaceBook LIVE concert, and I learned a lot. First, I was unbelievably nervous. I’m not sure where that came from, as there were really only five of us in the room, but the cameras added a whole new dimension to things. And, It was a lot of work getting everything setup, lit, cameras adjusted, graphics created. Ray and Eric are the masters at getting this done. Second, Facebook advertising is extremely useful for getting the word out about your events. It’s cost effective, and it really extends the reach of your page/event. Lastly, I learned that you have to be very clear as to where the video feed will be. I had many people tell me afterwards that they weren’t sure where to go on Facebook to see it. Thankfully the video remains on your page, and we will soon be uploading it to YouTube.